There has been a last minute revision to this weekend’s programme of activities. The weather forecast is generally lovely – 16 degrees and sunny with no rain forecast. However, the sea will be quite rough on Saturday and then relatively calm on Sunday. 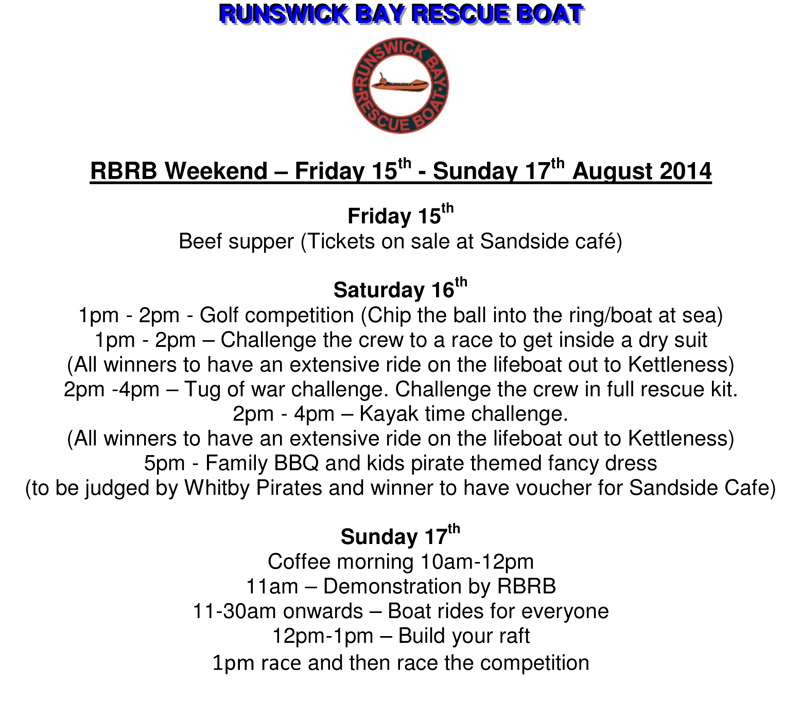 Consequently the much loved raft race has been moved to the Sunday afternoon. The full programme of events can be viewed below (click to enlarge). Whilst writing, it is worth us pointing out that there will be a strong offshore wind (Westerly) all weekend so please everyone be vigilant. The crew and committee of RBRB would like to express their thanks to all the recent fundraisers who work hard and are so generous with their time and money. 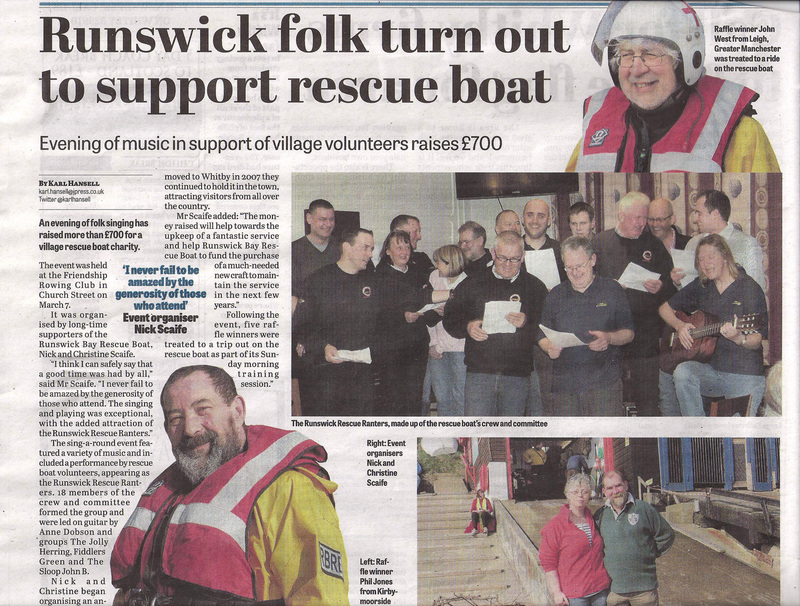 There was an article in the Whitby Gazette on Friday 23rd May 2014 covering a number of the recent events and donations (reproduced on the right). 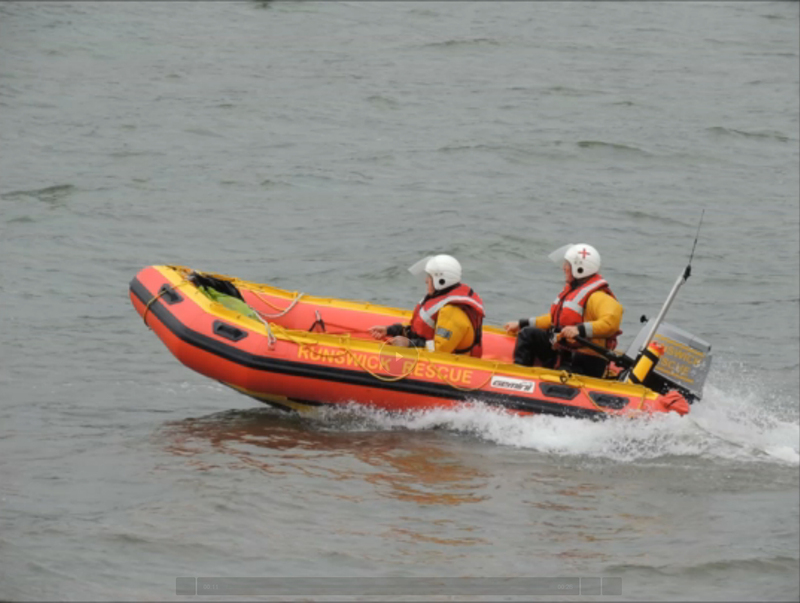 This year will be a busy year, with work ongoing to ensure that RBRB continues it’s service into the future by embracing the new MCA Rescue Boat Code and also the intended purchase of a new boat this summer (watch this space for further announcements). There was also a retirement party at Whitby Pavillion for Glenn Goodberry, the former mechanic on Whitby RNLI Lifeboat, and a valued supporter of RBRB. 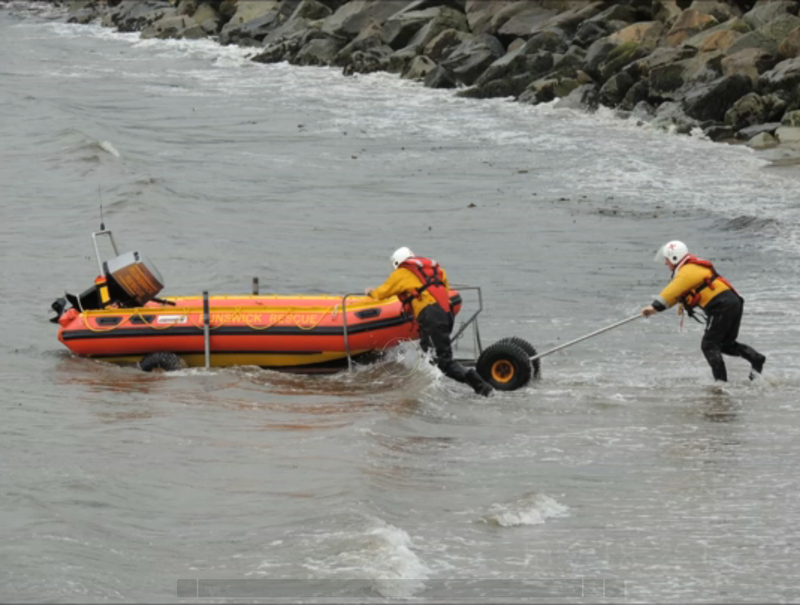 We would like to acknowledge Glenn’s, and all the crew and management at Whitby RNLI, contribution to helping us get off the ground some 32 years ago and helping us stay afloat all these years. 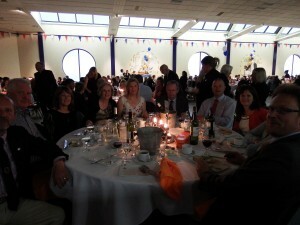 A number of the crew and committee of RBRB attended Glenn’s do (left) and helped give him a worthy send off. 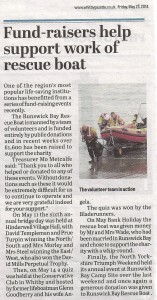 The below is a rather nice Whitby Gazette article published today about a fundraiser that took place on 7th March at the Friendship Rowing Club in Whitby. 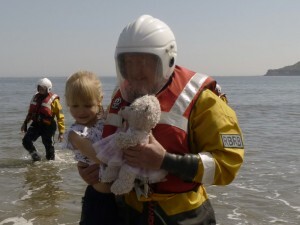 The event is an annual event organised by star fundraisers Nick and Christine Scaife. 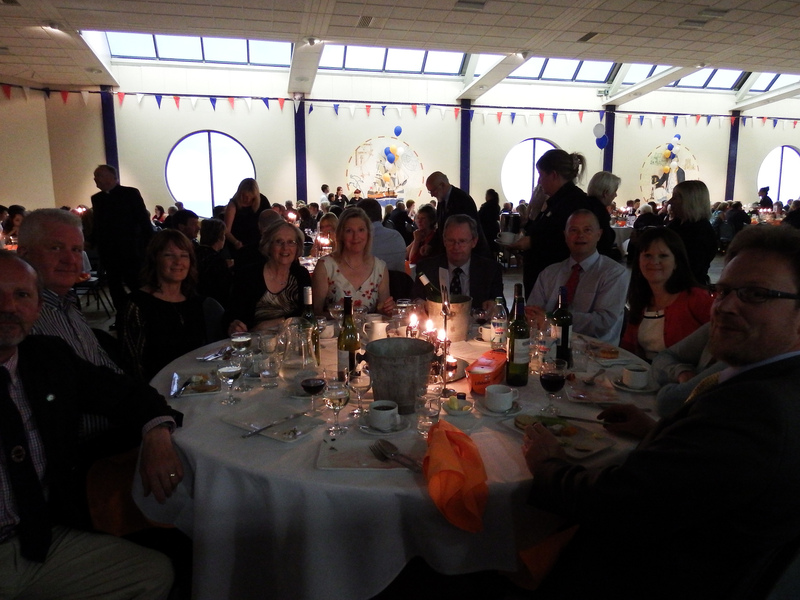 The Crew and Committee of RBRB extend their huge thanks and appreciation to the Scaifes for once again organising a tremendous evening and for all the other work they do throughout the year to help keep the Rescue Boat going. Don’t believe everything you read in the press … the final figure was much higher, after a fabulous fundraising weekend which many acclaimed to be the best yet. Well done everyone, and thank you to all who took part, contributed, organised, donated prizes and salads and worked so hard to make the weekend such a success. 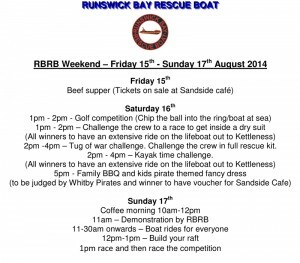 The Runswick Bay Rescue Boat was pleased to be invited to take part in the Lifeboat Display during Whitby RNLI’s Flag Weekend of 3rd/4th August 2013. Click on the picture below for a photo gallery. 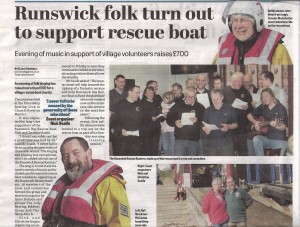 The below piece was published in the Whitby Gazette on Friday 3rd May 2013, following a demonstration of the new life-saving automatic defibrillator by the Runswick Bay Rescue Boat to the village of Runswick Bay at the Village Fishermens’ Institute. The purchase of the defibrillator, which is located on the exterior wall of the Rescue Boat house, was made possible by the very generous donation of £1,465 from the Co-Operative Community Fund. The annual Folk Night, organised by Nick and Christine Scaife, has raised another fantastic sum for RBRB. We are truly endebted to these stalwarts of fundraising (and other involvements, being Secretary and running the Friends of RBRB for us for some time too!) for their continuing marvellous contributions to keeping our service alive and thriving. The RBRB choir turned out in support and ‘entertained’ the crowds. 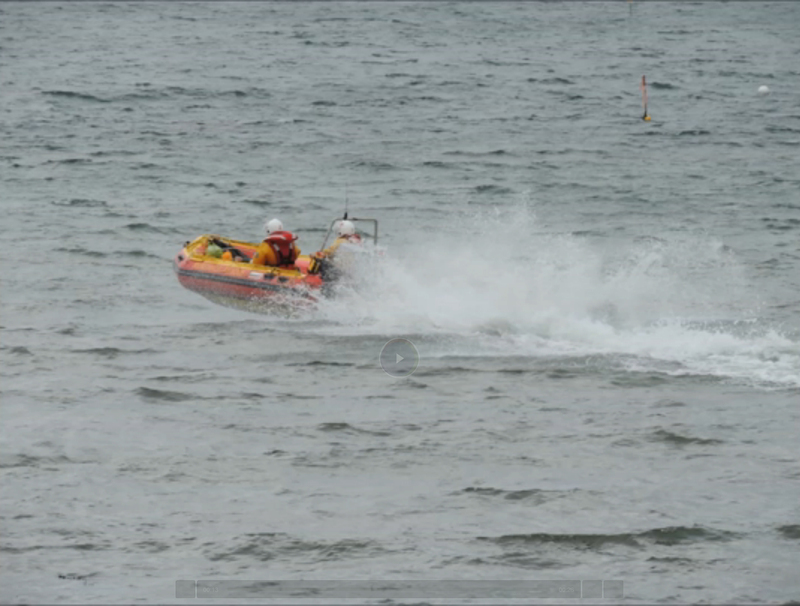 Six lucky winners also had the opportunity to try it for themselves, taking to sea in the rescue boat, the following Sunday morning. Our thanks to the Scaifes as we look forward again to the start of another season. Easter is only a few weeks away and RBRB is ready, with the newly installed and issued pagers now in situ and winter training having gone very well. At training on Sunday, Crew Leader Tom Dobson and veteran Helmsman Mike Sewell demonstrate how to right the Rescue Boat should the worst happen and she is tipped over in the surf on a service. 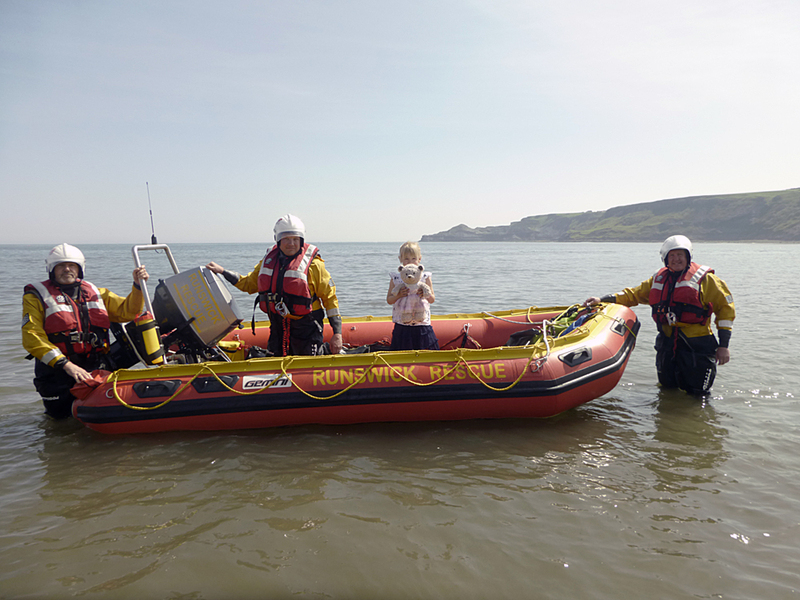 The crew of the Runswick Bay Rescue Boat give up their time to train every Sunday morning throughout the year and Wednesday evenings in the summer. 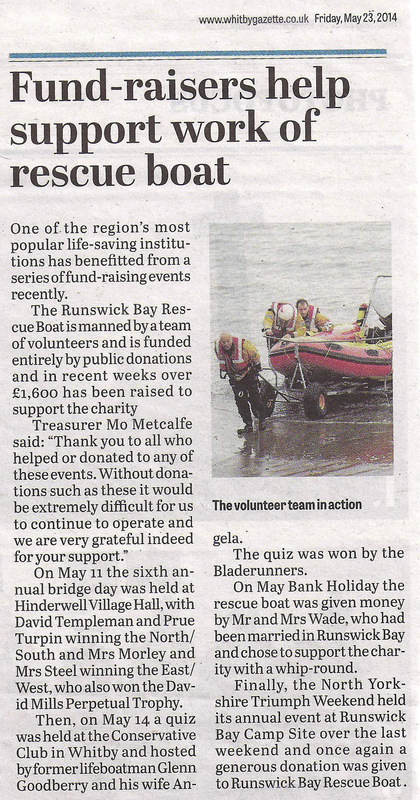 A Bridge Day, held on Sunday 8th July to raise funds for the Runswick Bay Rescue Boat made £857. Helpers from left: Ken Lydall, Chairman, organisers, Karen Sewell and Jan Walker, Crew, James Sewell and Mike Sewell and helper Lynne Lawson. The event was held in Hinderwell Village Hall where twelve tables played duplicate bridge in the morning and afternoon with a superb lunch in between. The bridge was kindly directed by Vicky Hirst. The day finished with prize giving and a raffle. The buffet lunch was provided by sponsors and helpers. Vicky Hirst and Ian Draper won the first prize: the Day Lewis Perpetual Trophy and card sets. Second prize went to Mary Winspear and Pauline Armstrong, also card sets. The best slam prize went to Roger Cohen and Sue Cheeseley. Rory O’Connor won the prize for last trick won with a two. 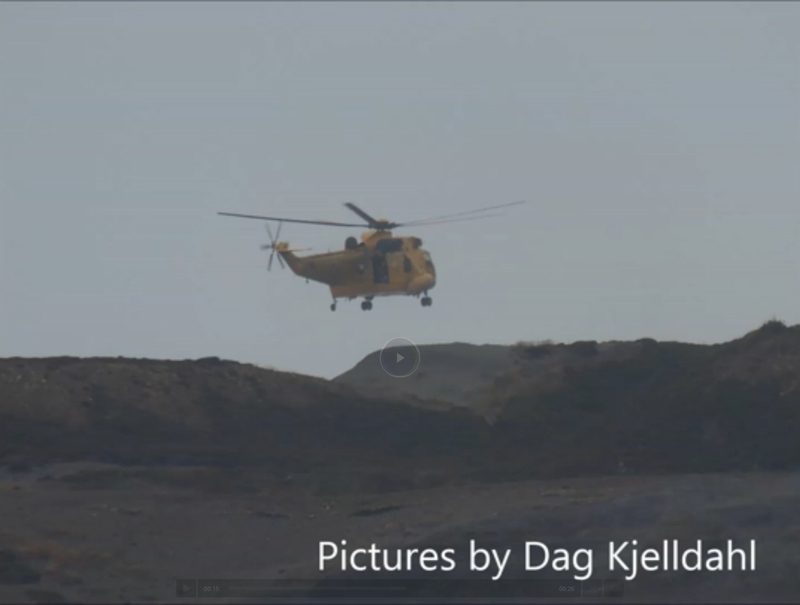 This was the fourth year of this event which has been sponsored by: Mr Bridge, Day Lewis Pharmacy, R H Ford and Son, Family Butchers, Glaisdale, The Royal Hotel, Runswick Bay and Whitby Bridge Club as well as many individuals. The Chairman of Runswick Bay Rescue Boat Committee, Ken Lydall, thanked Karen Sewell, Jan Walker, Sue Cheeseley and Mo Metcalfe as well as the many other contributors and explained that the money raised would kit out a volunteer crew member. Picture – Helpers from left: Ken Lydall, Chairman, organisers, Karen Sewell and Jan Walker, Crew, James Sewell and Mike Sewell and helper Lynne Lawson. On Monday 25th March 2012, a walker approached one of Runswick Bay Rescue Boat’s launching authorities to report a dog on Kettleness Beach that seemed in poor health and could not walk. He had carried it as far as he could but had to leave it. Humber coastguard was contacted and a crew raised at 3pm. After a search from sea proved fruitless, crew went ashore to continue the search and eventually found a black border collie. 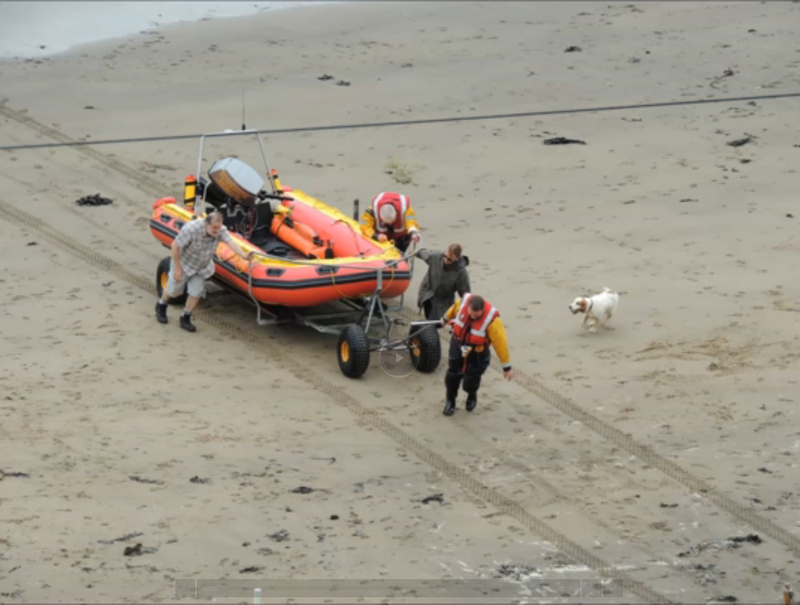 The dog couldn’t walk so crew carried it clear of rocks and onto the boat, recovering the dog to shore. Humber coastguard contacted the RSPCA and a vet from Clevedale Veterinary arrived on scene. 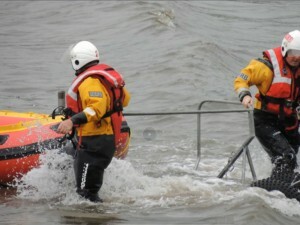 The dog was assessed and taken by the vet. 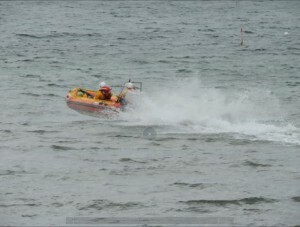 Crew stood down at 6:35pm. 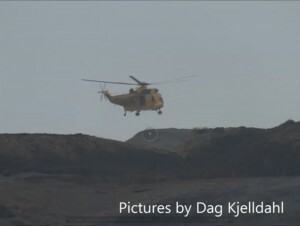 It is believed the dog could have been missing for a couple of days but was relatively healthy despite its ordeal. After the vet’s investigations the owner was found and re-united with their pet. 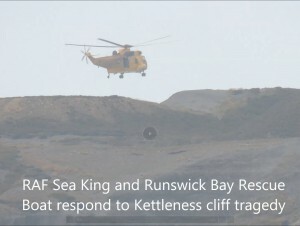 Runswick Bay Rescue Boat crew would like to thank the gentleman who raised the alarm and the couple who offered assistance to the crew on site.